A new lethal weapon has been developed. It kills silently by ravaging the body. It is a poisonous gas that destroys the flesh. There is no known defense. The U.S. Government has recruited the one man capable of capturing and disarming this weapon. This describes the plot of Getting Even better than we possibly could. But there are a few other things this helpful intro left out. Taggar, or “Tag” for short (Albert) is a Bruce Wayne-like industrialist/adventurer from Dallas who wears power suits during the day while in his massive skyscraper, Taggar Enterprises, and at night travels with an elite band of special ops and gets into action-packed scenarios. Taggar Enterprises specializes in “Chemicals, Robotics and Microtechnology”. Plus they have their own book, their building has a “TE” helipad for the official “TE” chopper, and they even have stylish “TE” jackets for their employees to wear in their downtime. Tag even zooms around in his rockin’ sports car with “TAG ENT” as the license plate. All this success must have really cheesed off rival Texan chemical researcher King Kenderson (Baker). He acts like a classic cowboy but deep down is an insecure man, constantly afraid of being labeled “a loser”. The flashy, capable and awesomely-named Taggar gets his goat so much, he steals canisters of the deadly gas weapon described above and threatens to release it over Dallas unless he gets fifty million dollars. So, with the help of Paige Starson (Landers), Taggar snaps into action in a series of stunts, fights and chases in a variety of different vehicles in order to take down Kenderson and save Texas. Can he do it? Here, Edward Albert throws his hat into a fairly crowded ring as another camouflage face-painted, rocket launcher-toting hero. He resembles a cross between Tom Selleck and Robert Goulet, and the whole affair is classic 80’s action fun. The plot is a bit bizarre, as rival chemical researchers battle for supremacy, but this different take makes Getting Even (not to be confused with the other Getting Even, 1988 with Harrison Muller, Jr.) worthwhile. The war between the suave city man and the “country bumpkin” is a tried-and-true “country mouse vs. city mouse” tale, but this one has lots of classic 80’s computers and a blasting theme song. 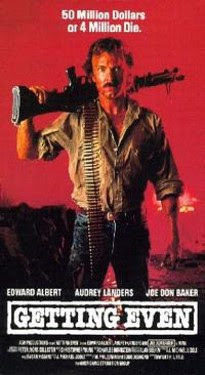 In the dialogue department, we get gems such as the shouted “Adios, Russkies!” during the opening action scene, and the ultimate moment in this film, or perhaps in all of Edward Albert’s career (and yes, I am aware we’re talking about Punchy himself) is when he yells at top volume and intensity, “KENDERSON!!!!!!!!! !” Great stuff. Great I tell you. Perhaps the film is set in Dallas to try and capitalize on the popular TV show of the time, but with an eye on giving action fans a reason to visit that city. It seems Taggar would have fit in well on that show. Released on VHS in the U.S. on Vestron, if you see it somewhere, pick up Getting Even. If the movie is even half as good as the cover art, I'm in. It is definitely good. Lot of fun action and Edward Albert is at his best! Looks excellent. Another for my long, long shopping list. Getting Even is worth purchasing just for the "KENDERSON!!!!" line alone! I love the idea of Joe Don Baker as a bad guy. This sounds fantastic. Joe Don Baker is really great in this. Very smarmy and evil. If you liked Joe Don as a bad guy then look up Ring of Steel. It's pretty good he plays the Man in Black I think he is supposed to be the devil or at least some how supernatural. He is really good in Ring Of Steel! We have a review on the site. You can get it on dvd-r at ioffer.com seller's name is videodust84..